The weekend was relaxing, slow paced and languid on choice. As we sat out sipping first tea, the Sun was already up. Delicious warmth of the Sun, nippy air, a million bird songs, aroma of autumnal blooms was like a lullaby. There being no compulsion to scurry in the kitchen packing tiffins and running around to be in time, we stayed out in the Sun in cheerful unconsciousness not bothering to keep a track of the time. A rustle of the leaves and some movement around our fish pond caught attention. 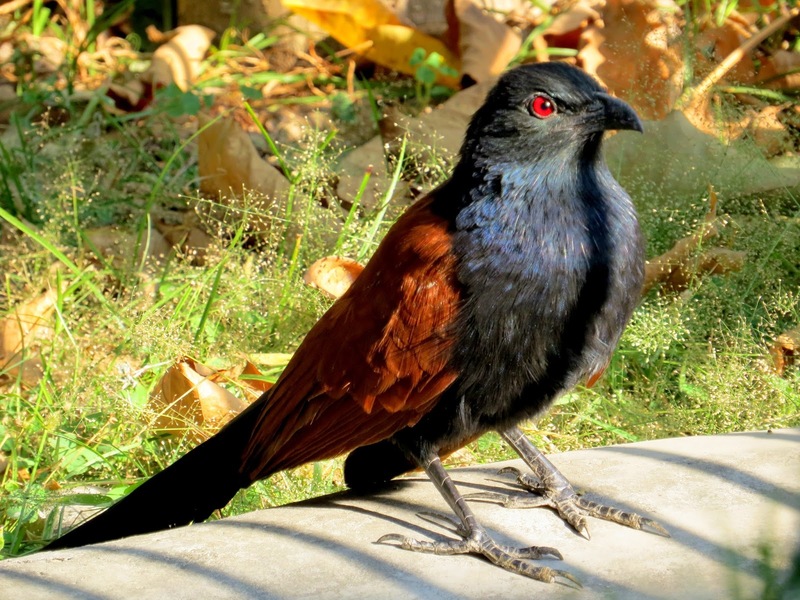 We saw a Crow Pheasant. Perhaps it was attracted by the water but a little reluctant to enter the pond. We placed a bird bath close to the pond or our guest. After a planned brunch, we gathered in our kitchen and soon there were animated conversations amidst the clink and clank of the pots and pans. We decided on baking Melon Pans. 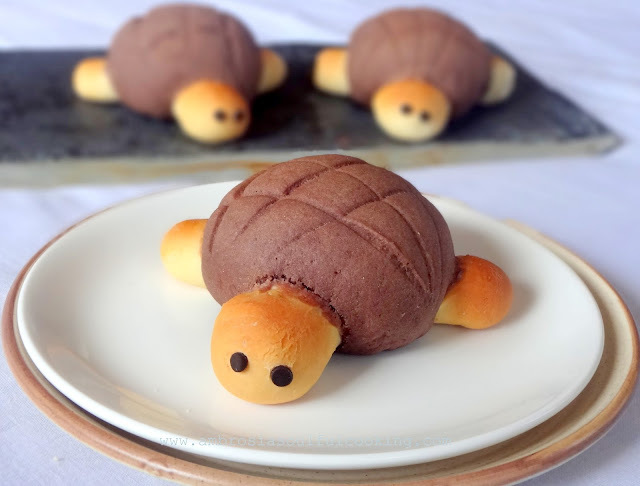 Kids wanted to have fun shaping some like turtles. There was a lot of mess but great fun too, and, the tray finally entered the oven. 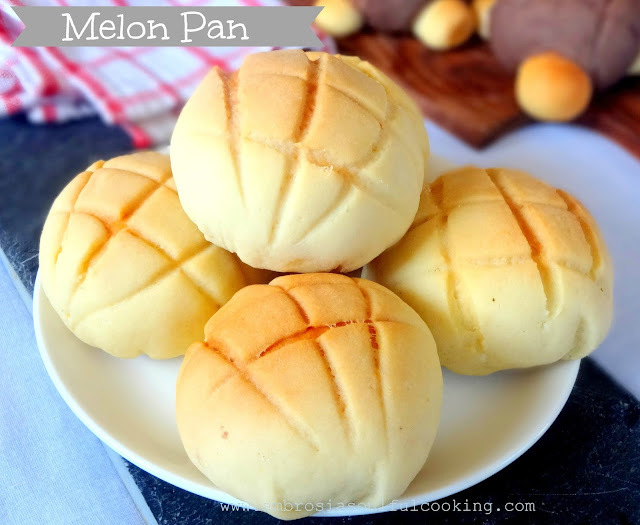 Melon Pan is a classic Japanese sweet bread covered with a thin layer of crisp cookie crust with grid line pattern on top. Melon pans are made from an enriched dough. 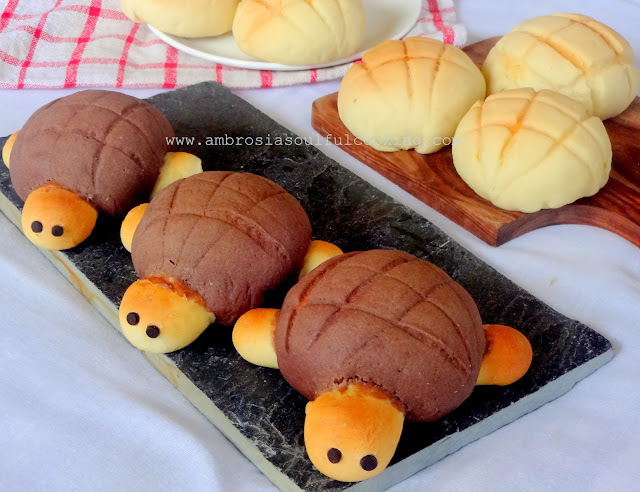 You’ll love to bite into the crisp cover with soft sweet buns inside. Now add beaten egg, warm milk and 3 ½ tablespoon warm water. Use a spatula to gently mix the ingredients together until well combined. Dough will be wet and sticky and a bit messy. You may use your hands to bring it together. In case if the dough is dry, you may add more water. Once it comes together as a loose ball, transfer it to the counter dusted with flour. Knead dough by pushing it forward with the heels of your hand and then pulling it back with fingers. Stretch the dough, fold the top half of the dough in half back toward you. Stretch and repeat. Repeat this process for about 5 minutes. This will develop gluten strands. The dough will become more and more manageable and supple. 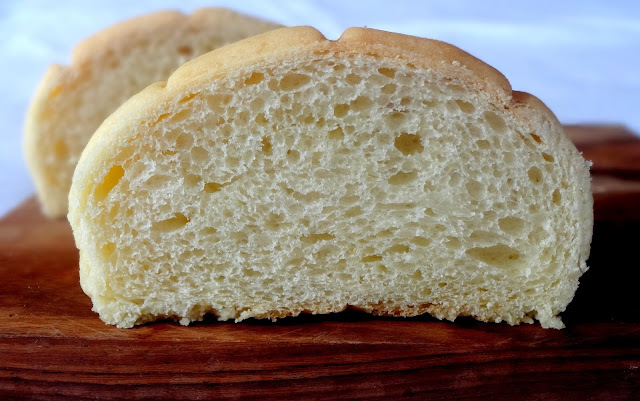 If dough is sticky, dust your hands with flour and knead. After 5 to 8 minutes, once dough becomes smooth and elastic, stretch into a rectangle. Put cubes of butter and roll up the dough. Begin to knead by stretching and pulling. Your hands and work surface will become greasy and messy initially but with time, dough will keep absorbing butter and become manageable. Bang the dough on work surface and roll it away from you. Repeat. Push out with the heels of your palm and pull it back. After 5 to 6 minutes, you’ll get smooth silky dough. Shape the dough into a ball by pulling from the sides to the bottom and pinching them together. Place in a greased bowl and cover with a cling film. Keep in a warm place for 1 ½ hour. Beat together butter and sugar till light and fluffy. Add to the wet mixture. Mix till dough comes together. Collect the dough and make into a ball. Keep in the refrigerator. After 50 minutes when the dough becomes hard, cut into 10 equal pieces. Take 3 pieces and keep the rest in the refrigerator. Crumble the three pieces and add cocoa powder. Knead till you get a uniform colour. Put it back in the refrigerator. Transfer the risen dough onto the counter, press the dough and deflate. Fold in in thirds and repeat. Shape it into a ball. With a sharp knife divide into half and make five equal pieces of both the halves. You get 10 pieces. Roll each piece into a ball by stretching and folding the sides. Cover with a wet kitchen towel and let it rest for 15 minutes. While the dough balls are resting, take out cookie dough pieces on the floured counter. Shape into balls and roll out into small circles of about 10 cm one by one. Take dough pieces. Deflate and fold in thirds. Shape into balls by stretching and folding. Take cookie circle in your hand, place dough ball with seam side up and wrap around cookie circle. Repeat for all the pieces. Dip the melon pans into a bowl with sugar. Dust off extra sugar and make three cuts each side with a knife. 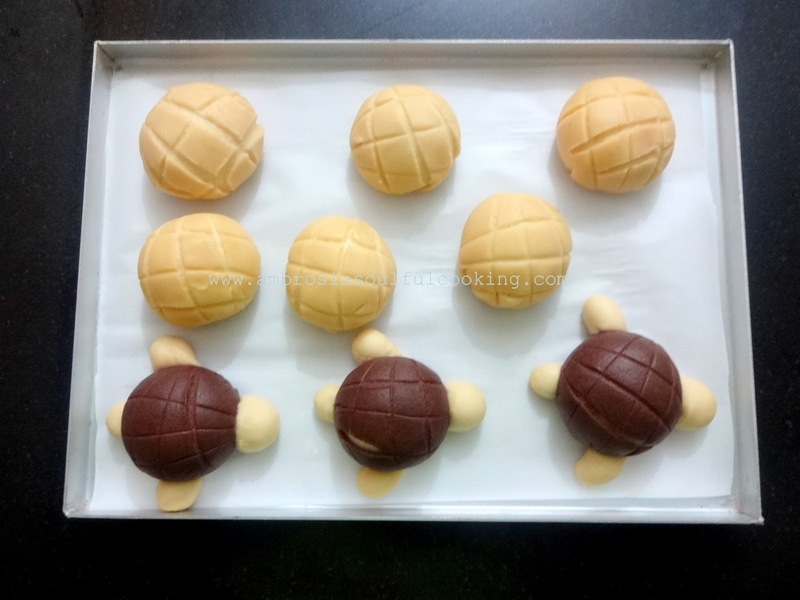 If you want to shape some like turtles, pinch out 4 small pieces of dough for face, two flippers and a tail. Shape the pieces. Prepare a paste with 1 teaspoon of all-purpose flour and water to get a glue like consistency. Dip them into this paste and attach them. Place on the baking tray, seam side down. Cover with a cling film and keep in warm place to rise for about 50 minutes. In the last 10 minutes, preheat oven to 180 degrees. Bake for 15 minutes. The tops should begin to brown. Cool in the rack. Store in an airtight container. Take 1 cup all-purpose flour. Remove 2 tablespoons flour. Add 2 tablespoons cornstarch. Mix well.